PROSPECT — With a major capital project in the books, the Region 16 Board of Education is looking ahead to several projects on the horizon, including the possibility of installing a turf field at Woodland Regional High School. The region, which is comprised of Beacon Falls and Prospect, completed a project to install air conditioning at Woodland, which only had air conditioning in a few common areas, around the start of this school year. This month, the Region 16 Board of Education approved transferring $260,000 from within the 2018-19 school budget to make the final payment for the project, which was done by MJ Daly of Waterbury. The $260,000 came from projected savings in special education, salaries and benefits, Director of Finance and Business Operations Pamela Mangini said. She said the district is expected to have savings in salaries and benefits due to staff turnover and replacing veteran teachers who left or retired after the budget was adopted with younger teachers whose salaries aren’t as high and typically cost less in benefits. Superintendent of Schools Michael Yamin said officials wanted to transfer the money to keep funds in the region’s non-recurring capital account for future projects. Mangini said the non-recurring capital account has about $280,000 in it. The top priority among future projects is installing air conditioning at Long River Middle School, which is now the only one of the region’s four schools without air conditioning. The lack of air conditioning became an issue during a heat wave early this school year that caused Long River to dismiss school early one day. The board has approved spending up to $40,000 to have options designed on how to add air conditioning to the school, which doesn’t have the duct work needed for air conditioning. “The school is not designed for air conditioning,” Board of Education Chair Robert Hiscox said. The money is coming from the board’s contingency account, Mangini said. As the board moves forward with air conditioning at Long River, officials are also eyeing several projects to revamp athletic facilities at Woodland, including replacing or repairing the track and tennis courts, and making the football field a turf field. The track and tennis courts are falling into despair. 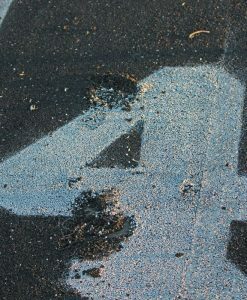 Cracks have formed in the tennis courts and the track is worn down and uneven in spots. Hiscox said the track’s condition has become a safety concern. Yamin said the region has spent thousands of dollars a year patching the track. “We’re throwing good money after bad,” he said. Yamin said officials are also going to look into the costs associated with making the football field turf. He feels a turf field is better to maintain over time and can be used by multiple high school and youth teams. Hiscox said there are pros and cons to a turf field, and the board will do its due diligence to explore the cost and implications of going to turf. The projects planned at Woodland aren’t expected to begin immediately, and the track is the top priority. Yamin said the board will form a committee to flesh out the details of the projects. Before any decisions are made any proposed project will be presented at a public forum, he said. As for paying for the projects, Hiscox said they could be funded through the budget over time, the capital account or through bonding. “All those options are on the table,” he said.